Approximately 40% of water used in summer is used outdoors which is when most areas face water shortages and have water restrictions. This water shortage period is when plants and trees require water the most. As populations grow, water shortages occur, more and more cities are incorporating metering systems as a way of monitoring and restricting fresh water wastage. Saving rain water saves money and helps the Environment - The more rainwater is used, the less the need to use chlorinated or other chemically treated tap water. The Watersaver Collection System hooks directly to your existing downspout and allows you to collect, save and reuse rainwater. Once installed, rainwater will flow from the downspout, thru the diverter and hose, into the collection container. In about 30 minutes you can be collecting rainwater. 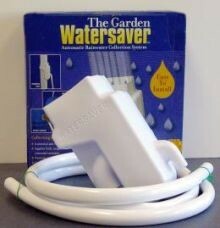 The system includes the downspout diverter unit, 5 foot long hose, and a deactivating plug. Once the collection container or water storage barrels are full the diverter allows the water to return flowing through the downspout.